We hope you've all had an amazing October holiday and are all nice and refreshed and ready for our first session back which will be on Saturday 11th November 2017 at 10am at the Seaforth Pavilion. Look forward to seeing you all then. Check out our Facebook page for some information on bike checks for the coming season! AYCC are organising a trip to the Revolution on Saturday 2nd December 2017 - full details on our Facebook page and although we have now booked tickets anyone who books tickets between now and then and who wishes to travel up with us are more than welcome!! We're always looking for volunteers to help us run AYCC and our sessions so, if you are interested, come along and have a chat at the session on Saturday or drop us a line any time. Annan Youth Cycling Club started out in 2009 after a successful trial with Scottish Cycling and Annandale and Eskdale Sports Academy. Our aim is to get kids from the ages of 6-16 into the fantastic world of cycling and provide coaching sessions in a fun and safe environment to develop the skills necessary to enjoy cycling. 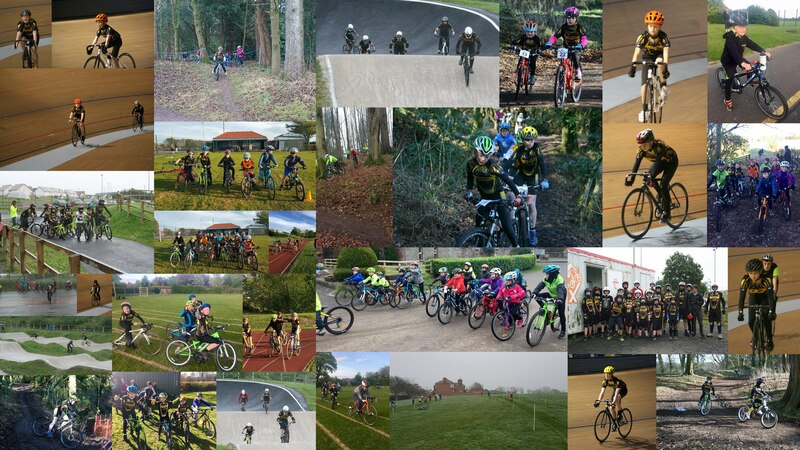 We hold weekly sessions in the Annan and surrounding areas and cover most disciplines of cycling including road, mountain and grass track racing. Our club is registered with Scottish Cycling as a go-ride club and is working toward club accreditation. We also work closely with Scottish Cycling to provide members with development opportunities through the various programmes they have in place. Our coaches are fully vetted through Disclosure Scotland. If your interested in seeing what we are about, pop along to one of our sessions and speak to one of our coaches. Coaching sessions normally take place at Seaforth Pavilion in Annan although we do occasionally deliver sessions at the Everholm, Hoddom Castle or other locations if they become available (we have been known to have sessions at the Sir Chris Hoy Velodrome or the Broadwood BMX Track in Cumbernauld (where our photo collage above was taken)) to allow us to deliver a wide variety of sessions and cycling disciplines. Keep an eye on our Facebook page for locations and times of our sessions!